Ohhhh, this book! Lovingly classified as ‘White Trash Noir’ this story shook feelings from me I didn’t know I could experience whilst reading! The story follows our protagonist, Nick ‘The Widowmaker’ Bullman, after he hits rock bottom. Firstly, you may ask, what is white trash noir? That is a solid question and one I am not fully sure I can answer correctly. 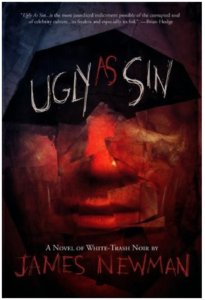 To me, ‘White Trash Noir’ is more of a feeling than a thing; if you read it, you will know it. I would describe it as gritty and tragic but oddly full of hope and humor as well. It feels real. The story of Nick Bullman is beautifully moving – I felt such sympathy for him – he’s pretty much a good guy who had his outward ‘humanity’ stripped away from him due to an event completely outside of his control. Because of this horrific event his entire life is turned upside down and when we meet him, he is at the bottom of it all. I feel at its core this is a story of love, redemption and reconciliation. The writing style is fluid and compelling; it kept me glued to the pages. Ultimately, what I took from this book is if you can salvage anything from the ashes of your past mistakes, do it. Our relationships we form in life are what truly matter. They are what make life worth living. Well done, Mr. Newman, all the stars to you! < Previous 2018 – the year of the book!